It was an exciting day for us, as we started up a new masonry restoration project in the East Ravenswood neighborhood of Chicago. Not only is this masonry building a 100-year-old beauty full of quality hand-chiseled limestone elements, but the Condominium Association was extremely accommodating and moved all of their vehicles away from our staging area, unlocked all access points, and closed all of their windows prior to our 7:00am arrival. 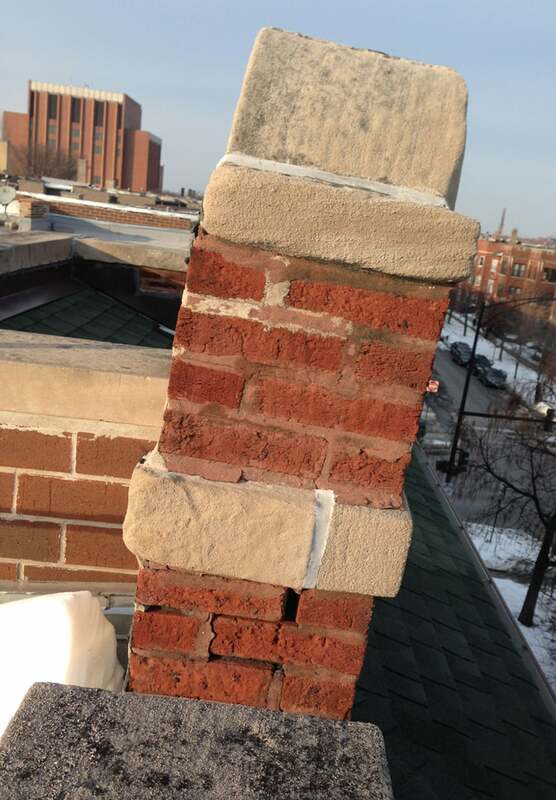 This Condominium Association was unaware until very recently that large sections of their brick columns and parapet walls were starting to deflect and pitch severely due to decades of freeze/thaw action coupled with inadequate repair work (refer to photo below, typical). Despite the deflection in the wall, many "tradesmen" continued to tuckpoint (i.e., apply a thin coat of mortar over the existing mortar joints) because it was the most expeditious method of repair and did not require a permit to perform the work (many repairmen/handymen are not licensed mason contractors and lack the qualifications to legally procure Masonry Repair Permits within city limits). On the brick column below at least three different mortar colors are apparent, meaning at least three separate applications of mortar had been made over the years. None of these mortar applications appear to be thicker than one's fingernail, so none of the repair mortar is capable of renewing the bond between the bricks or effectively thwarting wind-driven rain and sleet. I'll be posting more pictures of this project as work continues over the course of the next week.